Achilles, the famous Greek hero many know simply because of the weakness in his heel, for good reason too because injuries to the Achilles tendon are very common. But this devastating injury can be prevented if taking the proper steps. Keep reading for few easy ways to help prevent an achilles injury. The achilles tendon is a thick band of tissue that connects the calf musculature (gastrocnemius and soleus) to the heel bone (calcaneus). The action of the achilles tendon is to produce a shortening effect to raise your heel off the ground during walking, running and jumping; as well as a to produce a lengthening action to control forces during landing. There are several degrees of achilles issues ranging from achilles tendinitis, tendinosis, and a complete achilles rupture. Achilles tendinitis is an overuse injury of the tendon that produces inflammation to the achilles tendon. Achilles tendinosis is a chronic form of tendonitis when the inflammatory process has been going on for a prolonged period of time and the cellular structure has undergone change. A complete achilles rupture is the most devastating of the injuries listed above and involves a complete or partial tear of the tendon. Here are a few easy ways to help prevent an injury to this area. The achilles tendon absorbs a large amount of stress during sports and for that reason, if it is not properly warmed before activity it is placed at a higher chance for injury. Think of it similar to warm taffy that stretches when it is bent compared to cold taffy/brittle that will break when it is bent. 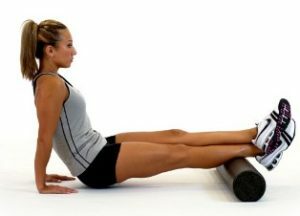 For this reason, it is highly important to warm up the specific tissue by activities like jump rope, jumping in place on your toes and foam rolling before any sports or activities. The calf complex is a common area of tightness due to our current sedentary lifestyle. 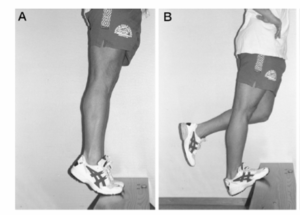 Because a key component of the achilles is to accept load and lengthen under tension, it is vital to have adequate mobility of the calf musculature. When the calves are tight, it adds extra stress to the structures and causes a repetitive tension every time you take a step which leaves the tendon prone to injury and possible rupture. A great way to counteract this is to stretch daily and post-exercise to improve mobility. Stretch at least for 2×1 min each side daily using a runner’s stretch for easy mobility improvements. The most common activity that results in injury to the achilles tendon occurs when the muscle lengthens such as when landing after jumping up for a basketball rebound. This occurs because the muscle is not lengthening (eccentric) with proper speed or control and when this happens the muscle can become injured or ruptured. There are many ways that you can strengthen the calves eccentrically, but the easiest is to perform an eccentric single or double leg heel raise. 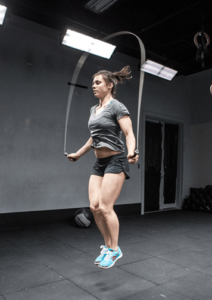 Jump training is an important aspect of everyone’s training and should be emphasized in a controlled environment such as a gym. 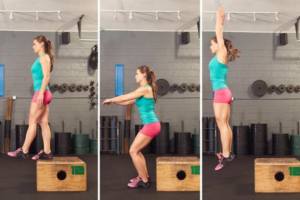 This is a safe environment for your body to adapt to jumping and other higher level activities. If you train your muscles to lengthen under load in a controlled environment then when it comes to sport or activities your tendons will be trained to perform accurately. This should include any activities that jumping, landing and other explosive activities. When performing jumping it is important to have good mechanics. This includes keeping the knees lined up over the second toe or slightly more lateral as well bending at the hips primarily when landing. Jordan was a competitive athlete in high school where he played soccer and ran track. He went on to attend Fresno Pacific University where he played Division 2 collegiate soccer. His love for sports, performance, and helping others drove him to the physical therapy field. Jordan graduated from Loma Linda University with his Doctorate in physical therapy. While in school he received his strength and conditioning specialist certification to better help his clients and blend the field of rehab.field of rehab and performance. He now practices in Orange County at a local CrossFit gym where he helps his clients achieve optimal performance and pain-free lives.